Hello. A yummy look at interiors today. 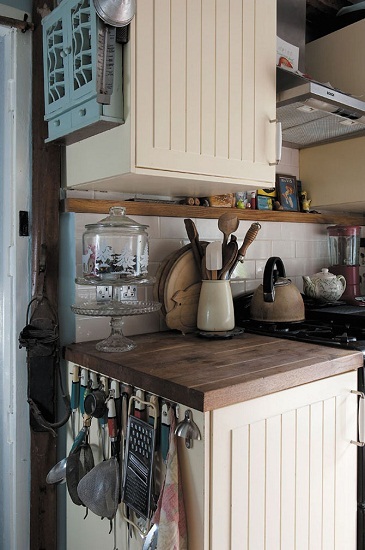 I just love the personality and warmth that shines through this tiny house - a one up, one down house, in Brighton. There may be a little too much stuff for me but I do like the vibe of the place. 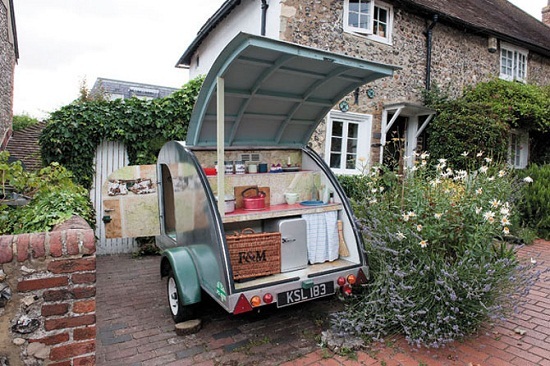 How cool is the micro-caravan pictured in that last photo? To read and see more at Wealden Times. We've been in our new house for five months now. We are loving our smaller, cost-effective and lower maintenance house and feel that instead of downsizing or smartsizing (which is a new term I've come across and prefer) we have actually upgraded. This is our fourth house and it is only just a bit bigger than our first. However, our new smaller and lower cost house has more usable space than our last (bigger) house which goes to prove that it's not how much space you have but how you use it. In previous posts I've talked about making necessary changes to our house to make it work for us. Within a tight budget we've still got some more jobs to do and things to purchase but to be honest buying a new door knocker or house number is not that exciting. By concentrating on the basics I think we've lost that initial enthusiasm for our new pad. What I can't wait to do is to add some character to our house. You know, put up some photos and pictures and unpack the last of our personal belongings. Our style is fairly minimal but we want to add a few personal touches to make our house feel cosy and welcoming. We have pared down our possessions and furniture and have kept only a few chosen decorative items; selected items that reflect our history, interests and personalities. Alongside some modern items we have several vintage/retro items such as a printer's letterpress tray so hopefully our house won't have that everything-matching-brand-new-bland look. Minimal meets eclectic may seem a contradiction but I think small spaces can still have style. I don't believe minimalists have to live in bare, white spaces. Do you? Thanks for sharing the link, I am positively drooling. I not best placed to comment on a minimalist approach as well you might gather from my blog but I do agree whatever your style I prefer it not to be everything matching brand new bland look. It should say something about you, after it is your home and we all know how important shelter is, obviously taking into account how lucky we are in our Western society. I sure hope we don't have to live in bare white spaces! I love a place with character and that looks lived in. I love that little rustic house. 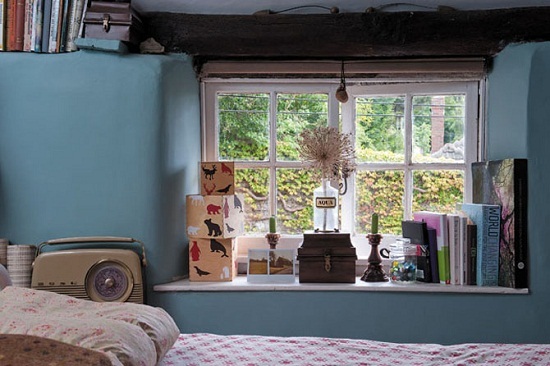 Not my style for living in, but visually adorable and complete. It makes me smile. 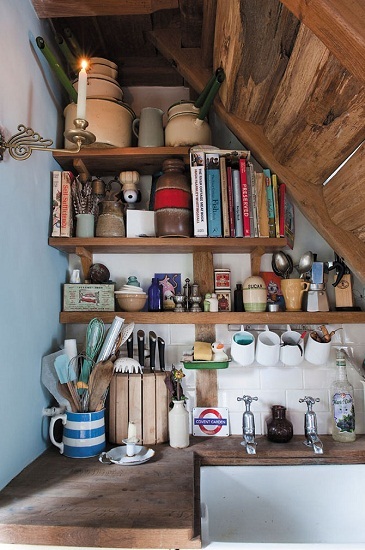 I love the little nook under the stairs, so cute. The micro-caravan looks very sophisticated too. I live in a 3 bedroom house. I'd always imagined that we would live in a Victorian 4 bedroom house, but in reality, what we have now is absolutely fine. It's warm, easy to heat and just what we need. Plus I couldnt be bothered with cleaning a huge house every week! Minimalist Monday: Busy Bee or Lazy Lion?